In the midst of the usual summer silly season, rumours went round that the UK government was thinking of fully nationalising the Royal Bank of Scotland. What a good idea we say. Because far more than further appeals to bankers' decency and threats of regulation, this actually could have saved the soul of the financial services industry. When it rescued RBS in 2008-09 the government bought 84% of a pig-in-a-poke. With no time to look in the bag, £45 billion of taxpayer money was hurriedly handed over. Ministerial hopes to unload this embarrassing porker, that kept on snouting down bonuses in spite of continuing dismal performance, may lead to the government breaking up and selling the beast as chump chops. Already September 2012 saw RBS putting its Direct Line subsidiary on the block. If this continues, the taxpayer will be left with just the pig's squeal - which would suit the bankers just fine. Bankers and their political helpers assert that if we put a stop to excessive pay and lax regulation they would leave. And thus, they assert, Britain would have no banks. 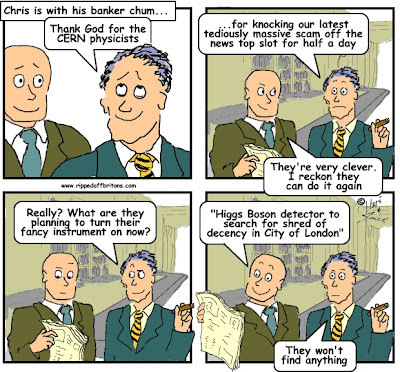 They want us to believe that the alternative to dodgy banks is no banks. A nationalised RBS could prove that the alternative to dodgy banks is actually not dodgy banks, run by people paid sensibly with their customers' interests at heart. Financial Services executives have always maintained an exceedingly effective smokescreen to avoid sanctions for their scams using their counter and call-centre staff as chaff. They avoid regulatory action with the excuse “a small minority have let us down.” They avoid controls on pay and bonuses asserting “most of our staff receive just a few hundred pounds”. It is true. 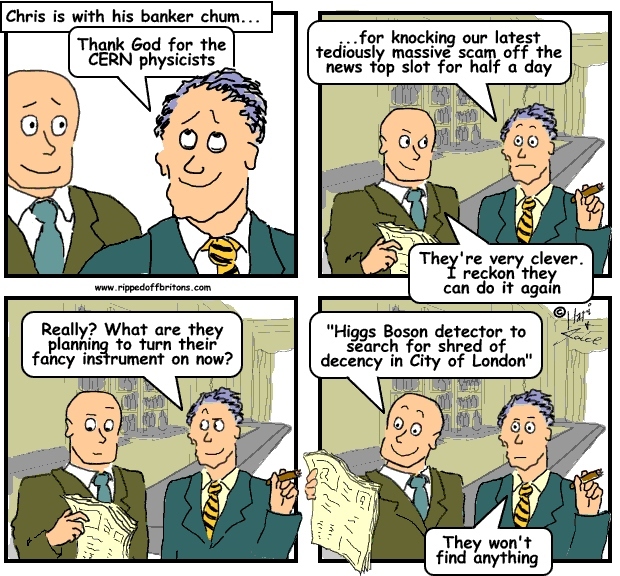 Most bankers are legal, decent, and honest. An excellent and effective piece of wisdom I heard somewhere: If you add 1 pint of sewage to 99 pints of milk you end up with 100 pints of sewage. It is this 1 pint that controls and corrupts the soul of banking. When he asserted that “a small minority have let us down”, Bob Diamond wrote the truth. At any one time only a small minority are caught in the spotlight of disgrace. Mis-selling of endowment mortgages was ancient history by the time Payment Protection Insurance (PPI) hit the fan, which had faded from the headlines by the time the LIBOR fraud was brought front and centre, which too will have exited stage left pursued by nothing much by the time the Interest Rate Swaps deceit gets its brief moments in the limelight. The summer of 2012 saw another clutch of banking insights from senior politicians and regulators. Through 2005, 2006, and early 2007, we see evidence of systematic greed at the expense of financial integrity and stability. They knew what they were doing wrong. “Keep a secret” one trader tells another in February 2007. “If you breathe a word of this I’m not telling you anything else”. Yet no one at Barclays prevents them. And no one in the tripartite regulatory system knows anything about it. Huge bonuses may have amazed and bewildered the ordinary citizen, but the experts were on hand to explain that in some mysterious way ever more intense and complex financial activity was increasing the total size of the economic cake, with the prosperity of all enhanced, even if less richly than that of some bankers. The reality being that all the growth went to the favoured few. For 90% of Britons, their prosperity has stagnated for decades. many of the key participants [dodgy bankers] have no direct contact with the end customers [that would be us] whose lives they are affecting, and only transient contractual relationships with their counterparties [other dodgy or incompetent bankers managing our savings]. And it is simply easier to make huge amounts of money out of a multi-step chain which connects ill-informed investors in one country to ill-informed sub-prime borrowers in another, and still go home believing that you are a fine upstanding member of society, than knowingly to sell a bad product or service to a customer with whom you have more direct contact. In short Turner observes that much of ‘financial innovation’ simply made it easier to rip off customers without meeting them. It is much easier to cheat someone if you don’t have to look them in the eye and you don’t have to see the consequences, the financial hardship and the repossessions, of your deceits and dissembling. We, as the regulator, intend to change this culture of viewing consumers simply as sales targets and I am going to be personally involved in getting this right. This will be part of the ongoing improvements we make to regulation as we seek to make markets work well and give people a fair deal. A document leaked by a member of Lloyds Bank counter staff exposes the incentives and pressures on junior bank staff. There is a view that people are not frightened of the FSA. I can assure you that this is a view I am determined to correct. People should be very frightened of the FSA. The bankers chuckled up their bespoke sleeves, with scant sign of nerves. And in March 2012 Sants announced his decision to quit, much to the indifference of the un-scared bankers. "In the UK up until the late 1970s, bank supervision was performed by the Bank of England on an informal basis, with a team of around 30 employees. Even when the Bank was given statutory responsibility in 1979, fewer than 80 people were engaged in the supervision of financial firms. In the period since, the number of UK financial supervisors has increased dramatically, rising almost forty-fold (Chart 1). In response to the current crisis, regulatory numbers are set to rise further. Over the same period, the number of people employed in the UK financial services sector has risen fractionally. In 1980, there was one UK regulator for roughly every 11,000 people employed in the UK financial sector. By 2011, there was one regulator for every 300 people employed in finance." The financial services industry is unique in the wantonness of its excesses. Other professions are paid very well, but on the whole their members have to prove their worth in formidable tests. Lawyers have to show they are smarter than other lawyers. Accountants have to show they are smarter than taxmen. Doctors and engineers have to prove they can outwit nature – keeping patients healthy, keeping a building standing, a ship floating, a plane flying. Sportsmen compete in the most public way possible, and entertainers wrestle with the unforgivingly fickle public voting with their television remote controls. But financiers simply have to steal the blouses off grannies’ backs. Surely it is no surprise that excessive pay attracts people who do whatever is necessary to be paid excessively? So we say, nationalise the Royal Bank of Scotland. Run it like a “Peoples’ Bank”, paying sensible salaries and making sensible profits. Cap remuneration at £1m (the new Barclays CEO is on £8.6m including bonuses etc) - if that isn't incentive enough then find people with nobler motivation. That would frighten bankers far more than a ruthless regulator’s or a malleable minister’s empty threats. Nationalising RBS will also provide a refuge for those who have been scammed by excessive overdraft charges, PPI, and all the other stuff. And also for banking staff who are fed up of scamming their fellow citizens. Currently our choice is to jump from one frying pan to be sizzled in another frying pan. Bankers fear nothing more than a bank being run successfully by people on ordinary salaries who do not resort to excessive charges and other scams. The silly season saw talk of nationalising the Royal Bank of Scotland. It’s not such a silly idea. Nationalise RBS. Bankers, with no fear of politicians or regulators, would fear nothing more than this. Britons would be far less ripped-off. I come from a place with a large publicly owned bank, as well as a very vibrant credit union movement. It's helpful to the government to control the bank, as a tool of public policy, but I never noticed that it was better than a private bank otherwise (perhaps freer with loans that addressed public policy). But the real value for citizens came from the credit union movement, which was locally controlled, kept member needs at the forefront, bought hundreds of local branches when the big banks bailed, and provided competition that forced the big banks to control their rapaciousness. I say dump RBS and build a serious credit union movement in the UK. The royal bank provides the customer with numerous services. These incorporate credit card services, online banking, loans, insurance services, investment advice, mortgages and many other banking services.